SafeHouse Web is honored to present this guest blog post from Mike Glover, Internet Marketing Specialist and trusted colleague. Ranking high in the Search Engine Results Page (SERP) is no longer optional if you want to succeed with an online business…it’s mandatory! The amount of content that is searchable is growing and expanding by the minute. 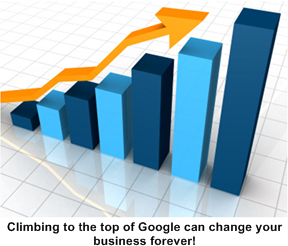 Finding your way to the top of the SERP can seem like an overwhelming or impossible task. Rest assured it is not impossible, nor is it an option if you want to grow and expand your business. With a little over 88 Billion searches occurring on Google each month, it’s obvious that the Internet has become the new Yellow Pages. As a society, we now search the internet for everything from driving directions to product reviews while we stand in the store and stare at a potential purchase. Smart phones, laptops, tablets and the abundance of free WiFi has made us an extremely mobile and search agile society and these numbers are predicted to more than double in the next 5 years. So let’s look at some real numbers and see if an Organic Search Engine Optimization program is right for you. 57% of all Internet users conduct a search on the internet every single day! 46% of all daily searches are for information on a product or service. 20% of all monthly searches are for local businesses. 70% of all click-through links on the SERP are on Organic Listings, not the Paid Links. 60% of all organic link clicks go to the top 3 Organic Listings. 75% of search engine users NEVER go past the first page of the search results. If you would like an actual spreadsheet that helps to calculate your SEO Return on Investment, you can contact the author below for a free copy. Mike Glover is an Internet Marketing Specialist at click-finders.com. Mike has been building websites and performing SEO Services for over 10 years. Click-finders.com offers a full range of Internet Marketing services including SEO Services, PPC Management, Social Media, Inbound Marketing, Affiliate Marketing and more. Contact Mike through www.click-finders.com, Twitter, Facebook and our Organic SEO Blog to learn more about Organic Search Engine Optimization and even request a free SEO Website Analysis.